BEST QUALITY! 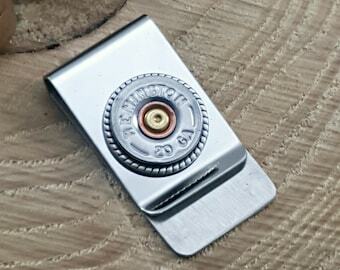 Shiny STAINLESS STEEL money clip. We do not use nickel money clips. Stainless steel will not tarnish, it resists fingerprints and scratches and it will wear better over time. These clips are lightweight yet sturdy, and will hold money and/or credit cards securely. 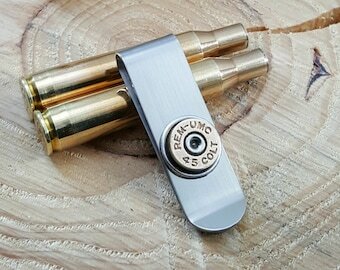 Casings are set in our signature smooth brass bezels before securing to the money clips. 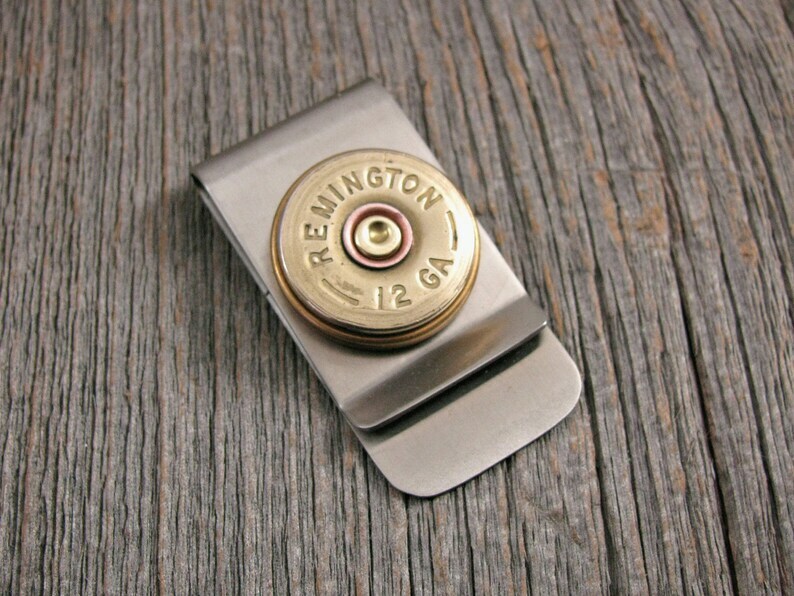 The bezel gives the shotgun casing a framework and quality finish that will last a long time. We never pancake slice and glue them to the money clip. Brands of casing vary. Use dropdown to select your brand preference. If you have no preference, please select "You Choose". A great gift idea for dad, uncle, son, the hunter or sportsman in your life. Rugged, masculine and smart looking! WANT A DIFFERENT GAUGE? 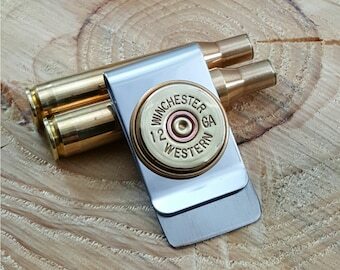 See other listings for our 20 gauge variety. 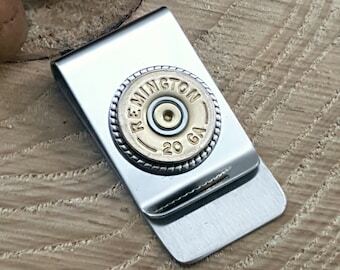 LOOKING FOR A BULLET OR RIFLE CASING MONEY CLIP? See other listings. We have those too. They are offered in both a standard money clip and also our slim style variety. HAVE A WEDDING COMING UP? Consult with us for complete wedding party packages. We have cuff links, tie tacks/lapel pins, key chains and tuxedo buttons utilizing both bullet casings and also typewriter keys. Convo us for more details or visit our separate SureShot Jewelry website to learn more about our packages.